It’s easier to remember something when you turn remembering it into a story. The zanier the details, the better! One of the biggest reasons why I like tales written for this age group so much is that they almost always rhyme. There is something extra special about reading this sort of thing aloud and hearing the echo of certain syllables from one stanza to the next. Occasionally the humor in the rhymes surprised me due how nicely they fit in with the illustrations. Some of them were quite creative and not at all what I was expecting to see associated with those particular letters. The children’s introduction was a bit too lengthy for the age group for which it was intended. It was well-written, but I don’t know many toddlers or preschoolers whose attention span is long enough to sit through so many instructions about what they’re about to experience. The information in it could have easily been included in the introduction for adults instead. Speaking of the illustrations, they were well done. Their clean, simple lines worked well with the subject matter. The use of bright, primary colors was a good choice. My eyes were especially drawn to the letters that relied heavy on the use of blue and yellow to show where they were located or what they were doing. They kept my attention long after I’d read the stanzas on those pages. 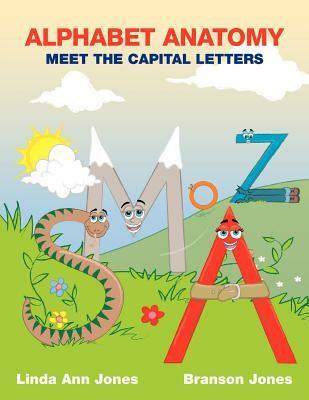 Alphabet Anatomy: Meet the Capital Letters was a fun read. I’d recommend it to anyone who is in the market for a storybook on this topic.